For broader coverage of this topic, see Ante-Nicene period. While the Jewish Christian church was centered in Jerusalem in the 1st century, Gentile Christianity became decentralized in the 2nd century. 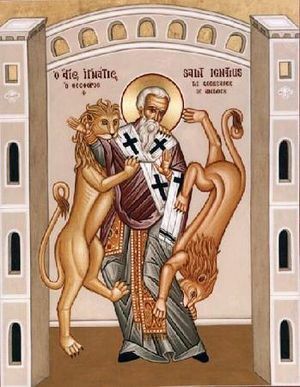 Although the use of the term Christian is attested in the Acts of the Apostles (80–90 AD), the earliest recorded use of the term Christianity (Greek: Χριστιανισμός) is by Ignatius of Antioch about 107 AD, who is also associated with modification of the sabbath, promotion of the bishop, and critique of the Judaizers. Eastern and Western Mediterranean Christians had a history of differences and disagreements dating back to the 2nd century. Among the most significant early disagreements is Quartodecimanism. Until the late 2nd century there was a difference in dating the celebration of the Christian Passover/Easter between Western churches and those of Asia Minor. The churches in Asia Minor celebrated it on the 14th of the Jewish month of Nisan, the day before Jewish Passover, regardless of what day of the week it fell on, as the crucifixion had occurred on the day before Passover according to the Gospel of John. At the time, the West celebrated Easter on the Sunday following the 14th of Nisan. Victor, the bishop of Rome, attempted to declare the Nisan 14 practice heretical and excommunicate all who followed it. On this occasion Irenaeus and Polycrates of Ephesus wrote to Victor. Irenaeus reminded Victor of his predecessor more tolerant attitude and Polycrates emphatically defended the Asian practice. Victor's "excommunication" of the Asians was apparently rescinded, and the two sides reconciled as a result of the intervention of Irenaeus and other bishops,including Tertullian. Both Tertullian and Irenaeus were pupils of Polycarp, who was a student of the Apostle John and, according to Polycarp's own written words, was also a "hearer" of the other Apostles. Polycarp was a bishop in Smyrna. The development of doctrine, the position of orthodoxy, and the relationship between the various opinions is a matter of continuing academic debate. Since the Nicene Creed came to define the Church, the early debates have long been regarded as a unified orthodox position against a minority of heretics. Walter Bauer, drawing upon distinctions between Jewish Christians, Pauline Christians, and other groups such as Gnostics and Marcionites, argued that early Christianity was fragmented, with various competing interpretations, only one of them eventually coming to dominate. While Bauer's original thesis has been criticised, Elaine Pagels and Bart Ehrman have further explicated the existence of variant Christianities in the first centuries. The earliest of the divergent teachings which developed in the second century were generally Christological in nature. Docetism held that Jesus' humanity was merely an illusion, thus denying the incarnation; Arianism held that Jesus, while not merely mortal, was not eternally divine and was, therefore, of lesser status than God the Father. [note 1] Many groups were dualistic, maintaining that reality was composed into two radically opposing parts: matter, usually seen as evil, and spirit, seen as good. Orthodox Christianity, on the other hand, held that both the material and spiritual worlds were created by God and were therefore both good, and that this was represented in the unified divine and human natures of Christ. Trinitarianism held that God the Father, God the Son, and the Holy Spirit were all strictly one being with three hypostases. In the middle of the 2nd century, three unorthodox groups of Christians adhered to a range of doctrines that divided the Christian communities of Rome: the teacher Marcion; the pentecostal outpourings of ecstatic Christian prophets of a continuing revelation, in a movement that was called "Montanism" because it had been initiated by Montanus and his female disciples; and the gnostic teachings of Valentinus. The Gnostics claimed to have received secret teachings (gnosis) from Jesus via other apostles which were not publicly known, or in the case of Valentinius from Paul the Apostle. Gnosticism is predicated on the existence of such hidden knowledge, but brief references to private teachings of Jesus have also survived in the canonic scripture (Mark 4:11) as did warning by the Christ that there would be false prophets or false teachers. Irenaeus' opponents also claimed that the wellsprings of divine inspiration were not dried up, which is the doctrine of continuing revelation. Christianity differed from other Roman religions in that it set out its beliefs in a clearly defined way, although the process of orthodoxy (right belief) was not underway until the period of the first seven ecumenical councils. Irenaeus was the first to argue that his "proto-orthodox" position was the same faith that Jesus gave to the twelve apostles and that the identity of the apostles, their successors, and the teachings of the same were all well-known public knowledge. This was therefore an early argument supported by apostolic succession. Irenaeus first established the doctrine of four gospels and no more, with the synoptic gospels interpreted in the light of the Gospel of John. Early attacks upon alleged heresies formed the matter of Tertullian's Prescription Against Heretics (in 44 chapters, written from Rome), and of Irenaeus' Against Heresies (circa 180, in five volumes), written in Lyons after his return from a visit to Rome. The letters of Ignatius of Antioch and Polycarp of Smyrna to various churches warned against false teachers, and the Epistle of Barnabas, accepted by many Christians as part of scripture in the 2nd century, warned about mixing Judaism with Christianity, as did other writers, leading to decisions reached at the First Council of Nicaea, which was convoked by Emperor Constantine at Nicaea in 325 in response to further disruptive polemical controversy within the Christian community, in that case Arian disputes over the nature of the Trinity. The community and seat of the patriarchate according to Orthodox tradition was founded by Saint Peter and then given to Saint Ignatius, in what is now Turkey. The Christian biblical canon is the set of books Christians regard as divinely inspired and thus constituting the Christian Bible. Although the Early Church used the Septuagint, the apostles did not otherwise leave a defined set of new scriptures; instead the New Testament developed over time. The writings attributed to the apostles circulated among the earliest Christian communities. The Pauline epistles were circulating in collected forms by the end of the 1st century AD. Justin Martyr, in the early 2nd century, mentions the "memoirs of the apostles", which Christians called "gospels" and which were regarded as on par with the Old Testament. A four gospel canon (the Tetramorph) was asserted by Ireanaeus, who refers to it directly. The oldest list of books for the New Testament canon is the Muratorian fragment dating to c. 170. It shows that by 200 there existed a set of Christian writings somewhat similar[vague] to what is now the 27-book New Testament, which included the four gospels. Thus, while there was debate in the Early Church over the New Testament canon, the current books of the New Testament were accepted by almost all Christians by the middle of the 2nd century,[vague] with the exception of James, Hebrews, and 2nd Peter. However, these 3 books were also agreed upon and recognized as canon by church leadership shortly thereafter. Following Eusebius, the disputed books are referred to as the antilegomena. The Church Fathers are the early and influential theologians and writers in the early Christian Church, who had strong influence on the development of proto-orthodoxy. They produced two sorts of works: theological and apologetic, the latter being works aimed at defending the faith by using reason to refute arguments against the veracity of Christianity. In the face of criticism from Greek philosophers and facing persecution, Apologists wrote to justify and defend Christian doctrine. Justin Martyr's works represent the earliest surviving Christian apologies of notable size. The earliest Church Fathers (within two generations of the Twelve apostles of Christ) are usually called the Apostolic Fathers, for reportedly knowing and studied under the apostles personally. Important Apostolic Fathers of the 2nd century include Pope Clement I (died 99), Ignatius of Antioch (c. 35 – c. 110), and Polycarp of Smyrna (c. 69 – c. 155). In addition, the Shepherd of Hermas is usually placed among the writings of the Apostolic Fathers although its author is unknown. Those who wrote in Greek are called the Greek Church Fathers. Famous Greek Fathers of 2nd century (other than the Apostolic Fathers) include: Irenaeus of Lyons and Clement of Alexandria. Irenaeus of Lyons (c.130–c.202 AD) was bishop of Lugdunum in Gaul, which is now Lyons, France. His writings were formative in the early development of Christian theology, and he is recognized as a saint by both the Eastern Orthodox Church and the Roman Catholic Church. He was a notable early apologetic. He was also a disciple of Polycarp, who was said to be a disciple of John the Evangelist. His best-known book, Against Heresies (c. 180) enumerated heresies and attacked them. Irenaeus wrote that the only way for Christians to retain unity was to humbly accept one doctrinal authority—episcopal councils. 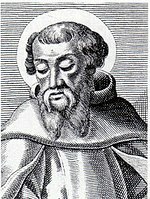 Irenaeus was the first to propose that all four gospels be accepted as canonical. Clement of Alexandria (c.150–c.215) was a Christian theologian and the head of the noted Catechetical School of Alexandria. Clement is best remembered as the teacher of Origen. He used the term "gnostic" for Christians who had attained the deeper teaching of the Logos. He developed a Christian Platonism. He presented the goal of Christian life as deification, identified both as Platonism's assimilation into God and the biblical imitation of God. Church Fathers who wrote in Latin are called the Latin Church Fathers. Tertullian was the first Latin Father and only well known such father of the 2nd century. Tertullian, who was converted to Christianity before 197, was a prolific writer of apologetic, theological, controversial and ascetic works, and sometimes known as the "Father of the Latin Church". He is said to have introduced the Latin term "trinitas" with regard to the Divine (Trinity) to the Christian vocabulary (but Theophilus of Antioch already wrote of "the Trinity, of God, and His Word, and His wisdom", which is similar but not identical to the Trinitarian wording), and also probably the formula "three Persons, one Substance" as the Latin "tres Personae, una Substantia" (itself from the Koine Greek "treis Hypostases, Homoousios"), and also the terms "vetus testamentum" (Old Testament) and "novum testamentum" (New Testament). In his Apologeticus, he was the first Latin author who qualified Christianity as the "vera religio" and systematically relegated the classical Roman Empire religion and other accepted cults to the position of mere "superstitions". Later in life, Tertullian is thought by most to have joined the Montanists, a heretical sect that appealed to his rigorism. By the latter half of the 2nd century, Christianity had spread east throughout Media, Persia, Parthia, and Bactria. The twenty bishops and many presbyters were more of the order of itinerant missionaries, passing from place to place as Paul did and supplying their needs with such occupations as merchant or craftsman. ^ Ehrman, Bart D. (2005). Lost Christianities: The Battles for Scripture and the Faiths We Never Knew. ISBN 0195182499. ^ "Catholic Encyclopedia - List of Popes". New Advent. Retrieved 2006-12-12. ^ "The Pastor of Hermas was one of the most popular books, if not the most popular book, in the Christian Church during the second, third and fourth centuries. It occupied a position analogous in some respects to Bunyan's Pilgrim's Progress in modern times." (F. Crombie, translator of Schaff, op. cit.). Bourgel, Jonathan, The Jewish Christians’ Move from Jerusalem as a pragmatic choice, in: Dan JAFFÉ (ed), Studies in Rabbinic Judaism and Early Christianity, (Leyden: Brill, 2010), p. 107-138.